Homemade Face Wipes for Acne - beautymunsta - free natural beauty hacks and more! These homemade face wipes for acne are an ingenious way to get your acne under control! 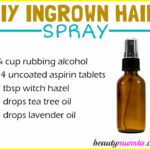 Witch hazel – Witch hazel is an astringent. It tones skin, reduces oiliness and tightens pores. 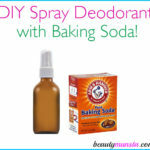 It also disinfects skin which is good for fighting off acne causing bacteria! Aspirin tablets – We’re going to be using the cheap non-coated aspirin tablets. Aspirin is acetylsalicylic acid. Yup that’s right. It acts as salicylic acid to tone your skin and reduce acne inflammation which minimizes the appearance of red angry acne. 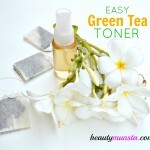 Tea tree essential oil – Tea tree oil is possibly the best essential oil for acne. It has powerful antibacterial properties that kill acne causing bacteria. It’s also refreshing and purifies pores. Lavender essential oil – Lavender oil is soothing and anti-inflammatory. It’s good for calming down inflamed acne. 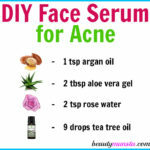 It reduces acne redness and irritation. Okay, now we know the benefits of each ingredient, let’s jump into the how to make part! Note: This keeps for about 2 weeks, by which time you will have used all of them. Make a new solution after 2 weeks. Use two pads in a day: once in the morning then in the evening when you get home. The first thing you’re going to do is crush the aspirin tablets. To do this, place them in a Ziplock bag then crush them to fine powder using a rolling pin. You can also use a mortar or even a hammer! Once that job is done, transfer the crushed powder into a Pyrex cup. 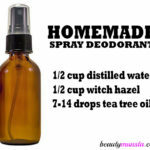 Now pour in ¾ cup of witch hazel and add 6 drops of tea tree and lavender essential oils. Mix everything together with a spatula to form a milky solution. Add the cotton pads to the jar then slowly pour the solution from the Pyrex cup over the pads. Turn the jar upside down to evenly distribute the solution to the cotton pads. Store in the bathroom cabinet. Use twice: once when you wake up and when you get back home in the evening. After use, moisturize with your usual face moisturizer or if you want to go natural, use a pea-sized amount of shea butter, a good natural acne cream! Are you ready to try out these all natural homemade face wipes for acne? They’re much better than the store-bought ones that’s for sure!